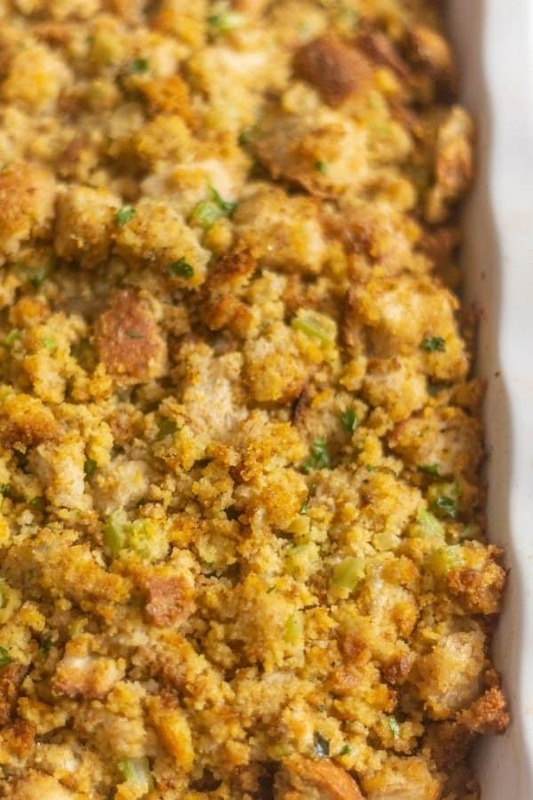 Southern Cornbread Dressing is my favorite traditional dressing/stuffing recipe. I always make this for Thanksgiving. I use my homemade cornbread recipe and another bread, usually Italian or sourdough as the base of the stuffing. A classic Thanksgiving side dish and always delicious! 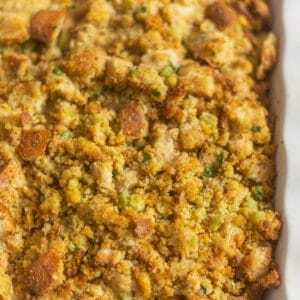 Homemade Cornbread as the base of this stuffing adds an amazing depth of flavor. It adds a buttery flavor and the cornmeal adds great texture. 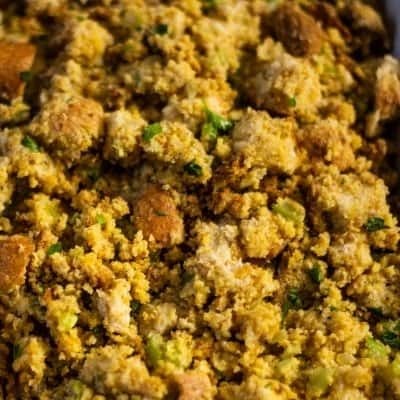 Personally stuffing is my favorite side dish for Thanksgiving! I started making this Southern Cornbread Dressing Recipe when my son Aidan was small because cornbread is his favorite and I always have a loaf in the house! Between the cornbread, Italian bread, herbs, butter, and egg, the flavors come together nicely and in no time, you have the most delicious moist Southern Cornbread Dressing! Stuffing or dressing, another one of those things like recipes like cheesy scalloped potatoes or au gratin, whatever you call it, just eat and enjoy! I don’t want to rock anyone’s dressing or stuffing boat! Here is my take on the “Is it stuffing or dressing?” Stuffing is traditionally put inside the bird before being baked. While dressing is cooked in a casserole. Again, call it whatever makes you happy, eat and enjoy! 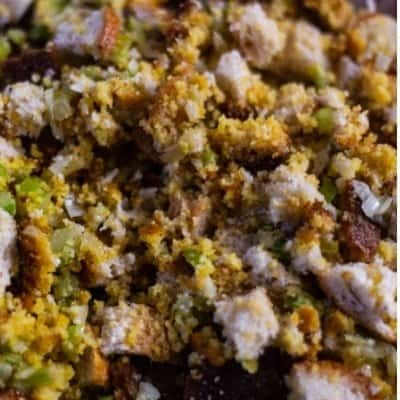 If you need to pick Team Dressing or Team Stuffing, this is a fun article about regions in the United States and the quest for a dressing/stuffing recipe! Can Southern Cornbread Dressing be made ahead? Absolutely. I make this the day before we are going to eat it and keep it well covered in the fridge until I bake it. **This is a dressing and it is not stuffed into the bird. Perfectly safe to make ahead! Will this Cornbread Dressing be made ahead and frozen? I have made it ahead of time but I do not bake the dressing. I freeze the dressing and once defrosted, I bake the cornbread stuffing. How long can Southern Cornbread Dressing be kept in the fridge? I keep the dressing in the fridge for up to three days, well covered in the fridge. It is so important to ensure food safety when dealing with poultry and turkey. One of my favorite sites for food questions is USDA Food Safety and Inspection Service! A go-to place for food safety info is here for anyone who wants to use this Cornbread Dressing inside a bird. Very important to refrigerate your Thanksgiving leftovers as soon as possible after dinner. This is a dressing. Do not use to stuff inside a bird because it uses ingredients that are sauteed. If reheating dressing and you find your dressing is a bit dry, add a bit of chicken stock. Sur La Table Set of 3 White Rectangular Baking Casseroles: I love white dishes and food, the food blogger in me! These are a favorite of mine and it is a set of 3. Lovely casserole dishes. Mercier Serrated Knife: A good bread knife for slicing the cornbread and Italian bread. This one is quite affordable and does a great job. Cube cornbread and Italian bread into small pieces. Saute onions, celery, and garlic in unsalted butter. 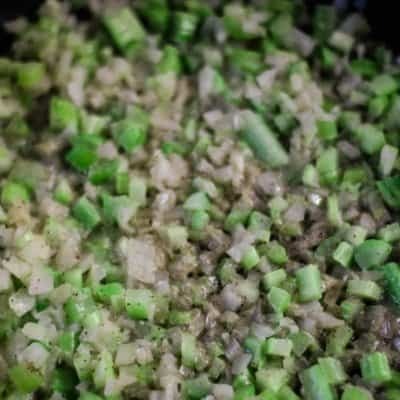 Add the sauteed onion/celery mixture and chicken stock into the cornbread mix. Season the cornbread dressing with ground sage, poultry seasoning, pepper, salt, and fresh parsley. Taste the dressing. Reseason if needed. Add in beaten eggs to the cornbread dressing. When you make this recipe! Take a pic! 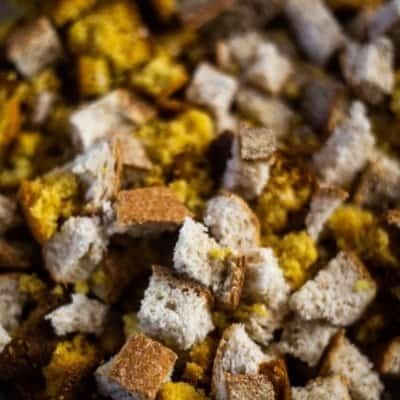 Traditional Southern Cornbread Stuffing made with homemade cornbread, fresh Italian Bread, butter, chicken stock, and herbs. 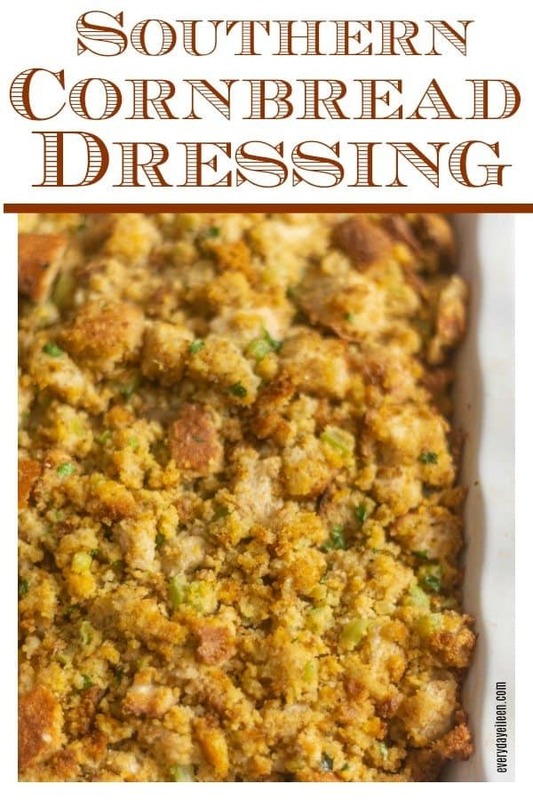 A delicious dressing/stuffing that's perfect for Thanksgiving or any Holiday! Preheat oven to 400 degrees. Spray a 9x13 casserole dish with non-stick olive oil spray. In a large saute pan melt butter. Add in celery and onions. Saute about 5 minutes. Veggies will soften. Add in garlic and saute another two minutes. Remove from heat. Set aside. Place the cornbread and Italian bread cubes in a large bowl. To the cornbread, add the butter/veggie combo, 2 cups of chicken stock, fresh parsley, poultry seasoning, sage, thyme, salt, and pepper. Check the seasoning. Reseason if needed. If the mixture is too dry, add some more chicken stock. 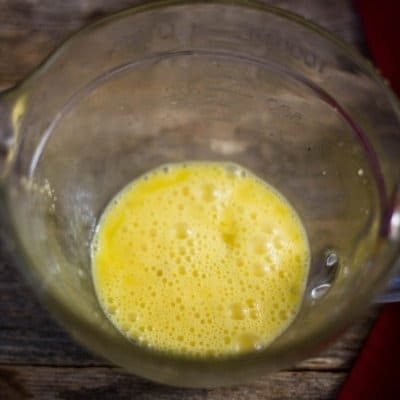 Mix in the beaten egg and mix everything well. Add the cornbread dressing mixture into the prepared casserole dish. Cover with aluminum foil. Bake for 30 minutes. Remove foil and bake for another 20 minutes. Serve and enjoy. Note 1: To dry out the bread quickly for dressing/stuffing: leave the bread on a large sheet pan overnight to become stale. Or place the bread cubes in the oven at 350 degrees for about 10 minutes to harden the bread. This is just like my families recipes but they add cream of mushroom soup and I don’t like adding the soup. I am going to be making your cornbread dressing for my family. Thank you for the recipe. I am so glad you enjoy my recipe for Southern Cornbread Dressing! Personally,I am with you on not using cream of mushroom soup.I can’t have all the extra sodium in my food. I hope you check back in after you make the dressing! Thank you so much for taking the time to comment! Happy Thanksgiving! Thank you Wendy! I hope you enjoy!